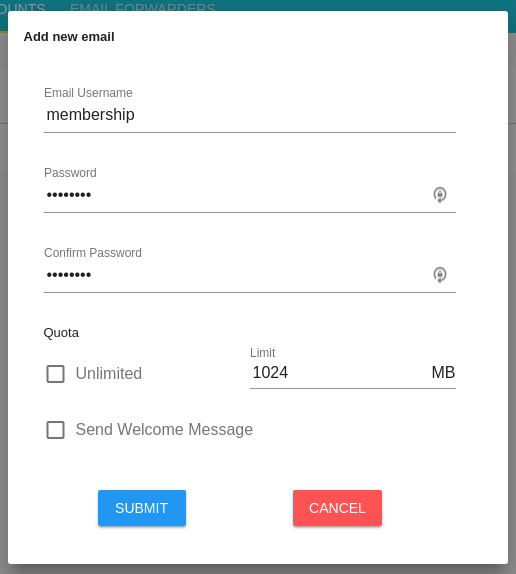 Member Splash Premium customers get unlimited email accounts and forwarders (also known as aliases) as part of your service plan. As of the 2019 season you can manage them from the Member Splash dashboard. To manage your existing email accounts and add new ones click on the Manage Email menu and then on the Email Accounts tab. If you have any email accounts configured they will be listed. To add a new account click on the green + sign at the bottom of the screen. To add an email simply put the email address you would like to use (only the portion of the address before the @ sign) and a password. You can specify the amount of storage space the email account should have, the default should be more than enough for most use cases (and it can always be changed later). The Welcome Message should be left unchecked. If you have existing email accounts you can change the password, the amount of storage space (quota), or delete the account. Your Member Splash Premium subscription also includes unlimited email forwarders. To add or delete email forwarders click on the Email Forwarders tab. Question: What is an Email Forwarder? Answer: An email forwarder (also known as an alias) is an email address that simply forwards messages on to another address. There is not an actual inbox for the email address and you can not send messages from that address. Many clubs use email forwarders so that board members do not have to check multiple accounts. They simply receive their pool emails at the same email address they already use. Example: Bob Smith is president of the pool this year. His personal email address is bobsmith@thesmithfamily.com. The pool creates an email alias for the address president@ourpool.com that forwards on to Bob’s personal address. Bob doesn’t need to set up anything new, but when he replies to a message sent to president@ourpool.com the reply comes from his personal address. If you have any existing forwarders they will be listed on this screen. Click the green + sign to create a new one. 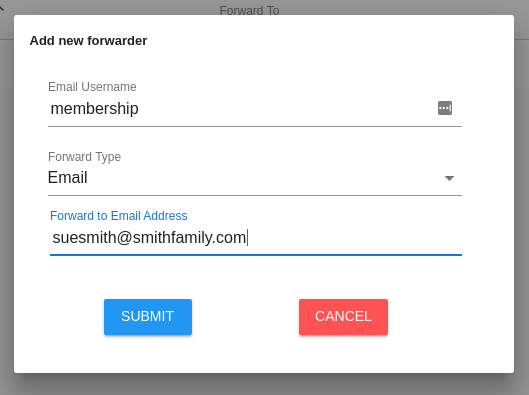 When creating a new forwarder you will enter the portion of the address before the @ sign in the Email Username field. For Forward Type choose Email. For Forward to Email Address put the destination email you would like the messages forwarded to. You can not edit an existing email forwarder. If you have a new board president and want to send messages addressed to president@ to that person you will need to delete any existing forwarders for president@ and create a new one. You can have multiple email forwarders for the same address. For example, if you an address like info@mypool.com you might want that to send copies to several different board members. Simply add as many forwarders as you need.